Thai Boat Museum is located at 12 Moo 1, Soi Bang Ian 8 (Khaw mala), Ian Road, Pratoo Chai district, Amphure Phra Nakhon Si Ayutthaya, Phra Nakhon Si Ayutthaya. Ayutthaya. The Thai Boat Museum was founded by professor Paitoon Khawmala in 1994 with a spiritual bond with river and boats since childhood. It also has a teacher who taught drawing and design of ships. Throughout life, who worked at the Technical School Shipbuilding (now College of Technology and shipbuilding industries) from 1958 until retirement in the year 1996 sees the progress in technology. Transportation and transit countries will makes of the boat used in the future would be less and wood as the main material of the boat will disappear and wood as the main material of the boat will go away after the youth generation does not know Thai vessels. And local vessels. 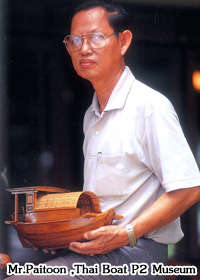 So he founded the Thai Boat Museum took place at home during the first For conservation and a source of learning. Re: Thai ship. Students to people who are interested. Both Thais and foreigners. The teachers have sacrificed a pension. And proceeds from the sale of the land. Second farm in Pathum Thani Province. The construction of more housing to the Thai Boat Museum You'll also have written a book "Thai Boat" was a series of 4 books to study to learn about different kinds of Thai boat. The objective is to provide Thai Naval Museum is a "source of learning about Thai Boat" "The Center for Thai Boat Knowledge" truly.